As a professional global power electronic instruments manufacturer, customer orientation is the principle of all of ITECHs activities. We have been devoted into research and development of Power Electronics for decades. By continuously understanding the testing needs of various industries, ITECH continues to provide users with competitive testing solutions. ITECH has become a fairly large scale power electronics test solution and equipment supplier with a wide range of product lines. ITECH is committed to product innovation, in hope that innovative products not only meet the users general test needs but also allow users to have new experiences through unique test technology and convenient software applications. The ITECH IT8211 is a cost-effective DC electronic load with performance specifications that rival any instrument in its class. 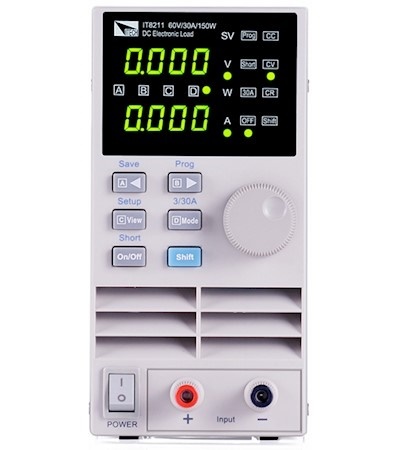 With a user-friendly interface including graphical charting, the IT8200 series provides various interfaces for remote communication to meet your diversified test requirements. Test power systems and batteries with configurable static, transient, and advanced application modes. IT8300 Regenerative DC Electronic Loads can not only simulate various load characteristics but can also feed power back to the grid without pollution. This eliminates the usual heat dissipation to a minimum and saves energy costs, adapts requirements of global energy-saving and reduces emission at the same time. IT8300 adopts high power density design, e.g. for 3 U size, and it can absorb power of up to 10.5 kW. 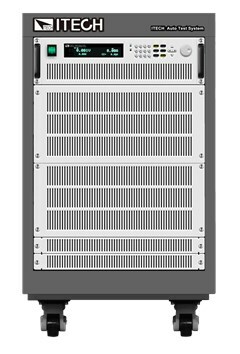 IT8300 supports master-slave paralleling and current equalized distribution, which can expand the power up to 105KW or more. The ITECH IT8500+ series is a single-channel programmable electronic load . With power ranges from 150W to 3000W . The user can perform online voltage measurements and adjustments or simulate short circuit test using the simple keypad on the front panel . It also offers a full - featured battery mode for discharging test . 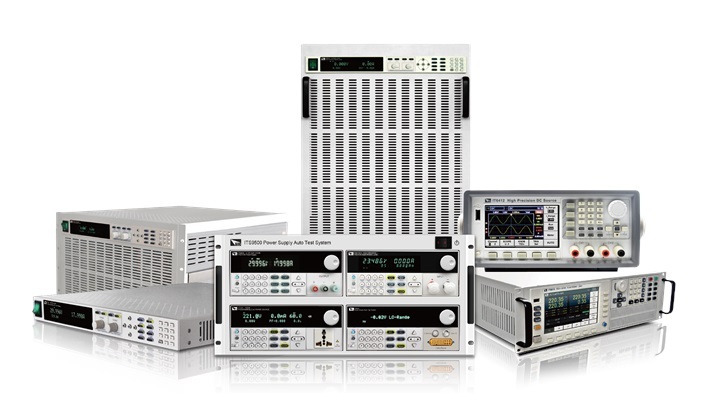 IT8500+ series DC loads are a versatile instrument for static and dynamic testing of power supplies , batteries , DC - DC converters , battery chargers , provides user the best testing solution. IT8600 has an adjustable frequency of 45 Hz ~ 450 Hz. The unique oscilloscope waveform display function of the IT8600 can display input voltage & current as a waveform. It is equipped with measurement modes for different parameters such as inrush current, peak value, effective value, PF (power factor). Voltage harmonics measurement capacity is up to the 50th. The built-in RS232, GPIB, LAN and USB communication interfaces are designed for reliable and fast control. 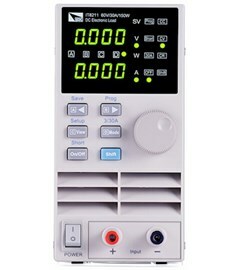 IT8700 series programmable DC electronic load adopt a removable module design. With a single frame it supports up to 8 channels and up to 16 channels with a mainframe extension. Users can freely choose the 8 load modules according to the number of channels and power requirements. They can be controlled by the mainframe control panel or by a host computer software via built-in LAN / RS232 / USB / GPIB interface. 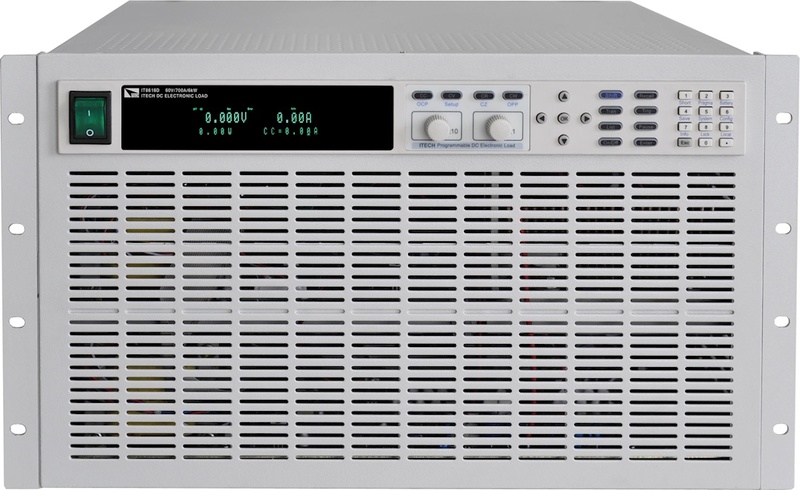 IT8800 series has a wide power range of 150 W ~ 55 KW, voltage and current measurement speed up to 50KHZ, resolution up to 0.1mV/0.01mA, adjustable measurement current rising speed of 0.0001A/us~2.5A/us and a built-in RS232/GBIP/USB interface. IT8900 series provide three voltage ranges(150V/600V/1200V). The power expands to 600kW by master-slave paralleling and maintains stand-alone functions. 50kHz high speed measurement, six working modes, transient over-power loading capability, CV loop speed adjustment, Measurement functions, 25kHz dynamic test and multitude of other accurate testing functions to make the IT8900 series a well-suited device for high power applications. IT8912E series high accuracy LED testing electronic loads can simulate the real output of LED lights with different characteristics. Their specific circuit can realize CR-LED mode, adjustable frequency, duty ratio PWM dimming (output port frequency: 20 Hz - 2 kHz). 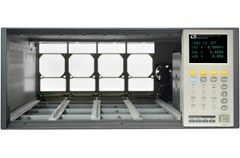 The I-pp/I-max measurement function can test current ripple and start up surge currents of constant flow LED sources. Voltage and current testing speed can reach 50 kHz.